The Arctic may not have smashed records for sea ice loss and land-based ice melt in 2013, but the region is still clearly undergoing rapid changes as a result of manmade global warming, scientists reported Thursday. The release of the annual Arctic Report Card, which was written by 147 scientists from 14 nations, shows that spring snow cover throughout large parts of the Arctic remains in free-fall, that older, thicker sea ice cover is a thing of the past, and that commercially valuable fish species, such as Atlantic cod and mackerel, have already moved northward in response to ocean temperature trends. Thanks to a relatively cool summer across much of the Arctic Ocean, Arctic sea ice extent at the end of the melt season was greater than the 2012 record low. But it was still much below the long-term average, having declined to the sixth-lowest level on record since satellite observations began in 1979. The map shows where sea surface temperature in August 2013 was warmer (red) or cooler (blue) than the 1982-2006 average. August 2013 sea ice extent (areas with at least 15 percent ice cover) is solid white. The seven-lowest sea ice extents have occurred in the past 7 years, and scientists expect further declines in summertime sea ice extent and volume to occur as global warming continues. Studies have shown that the Arctic could become seasonally ice-free by mid-century, with some scientists saying that could occur much earlier. “The Arctic caught a bit of a break in 2013 from the recent string of record-breaking warmth and ice melt of the last decade,” said David Kennedy, the deputy under secretary for operations at the National Oceanic and Atmospheric Administration (NOAA), at a press conference in San Francisco. “The relatively cool year in some parts of the Arctic does little to offset the long-term trend of the last 30 years: the Arctic is warming rapidly, becoming greener and experiencing a variety of changes, affecting people, the physical environment, and marine and land ecosystems,” he said. 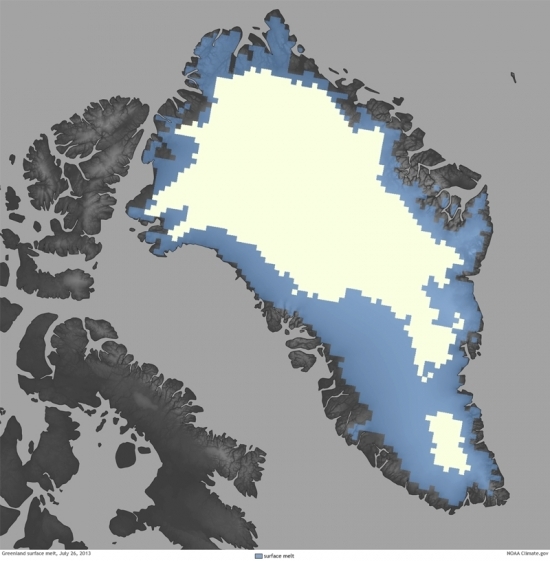 In Greenland, the ice melt area was drastically reduced from the record large melt area observed in 2012, and was instead closer to the recent average, the report found. The Arctic climate during the past year featured sharp swings between warm and cold extremes. For example, Eurasia had an unusually cold winter, but that was followed by spring air temperatures that were as much as 7°F above average. Meanwhile, unusually warm winter temperatures over the central Arctic Ocean, Greenland, and Baffin Bay were followed by unusually cool spring temperatures. The topsy turvy nature of Arctic weather patterns during the past year are best illustrated by what happened in Alaska, the only U.S. state that crosses the Arctic Circle. Alaska had its coldest April on record, but that then gave way to one of the warmest summers. In Fairbanks, temperatures reached or exceeded 80°F for a record 36 days. Map showing the surface melt extent on the Greenland Ice Sheet at the summer peak during the 2013 melt season. During the summer of 2013, the maximum area of melting on the Greenland ice sheet was 44 percent—the 14th highest in the 33-year record (1981-2013), but nowhere near the “extreme” 97 percent in 2012. Northern hemisphere snow cover extent during May and June was well below average in 2013, continuing a recent trend, the report said. Snow cover extent reached a record low in Eurasia, despite a frigid and snowy winter. The rapid melt of snow cover accelerates warming in the Arctic, as dark land surfaces absorb more solar radiation, and that warming also helps contribute to sea ice melt. 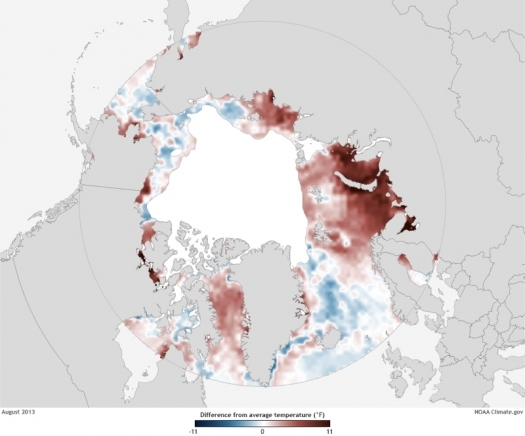 “Widespread, sustained changes that are driving the Arctic sytsem into a new state. Some would say that this has already happened, that the Arctic has shifted into a new normal,” said Martin Jeffries, science adviser for U.S. Arctic Research Commission and a professor at the University of Alaska in Fairbanks. One major theme throughout the report is how much scientists still don’t know about the Arctic, particularly when it comes to marine life. A lack of observations of fish populations, for example, prevent researchers from understanding how global warming is shifting fish species at different layers within the ocean. As the Arctic Ocean has rapidly opened in recent years due to sea ice loss, scientists have been scrambling to deploy observing systems to keep pace with the environmental changes. But they have bumped up against budgetary challenges and logistical constraints. “We have almost no observations of the currents, of the census of life” in new areas of open water, NOAA's Kathy Crane said at the press conference. The insights that scientists have been able to glean about changes to the oceans in the Far North show the same thing that is occurring on land — widespread, rapid change. The report found that 25 percent more heat and freshwater is now being stored in the Beaufort Gyre, which is a clockwise-moving ocean current that circles around north of Alaska and Canada. Much of that heat has been added during the summer and fall, coinciding with the most rapid time of sea ice loss. In addition, the report said that Atlantic mackerel and cod have already moved into Arctic seas, with a historically high amount — 2.1 million tonnes of spawning fish — of Atlantic cod in the Barents Sea. Norway and Russia shared a record Atlantic cod quota in 2013, and the report warned that increased industrial fishing could alter local fish populations, especially since no fisheries management limits have yet been put into place for international Arctic waters. U.S. Coast Guard Icebreaker Healy, which is one of only two icebreakers that the U.S. currently operates. Jeffries said new observing networks are urgently needed in the Arctic, and efforts are underway on an international level to deploy more instruments to monitor the oceans and atmosphere in the region. 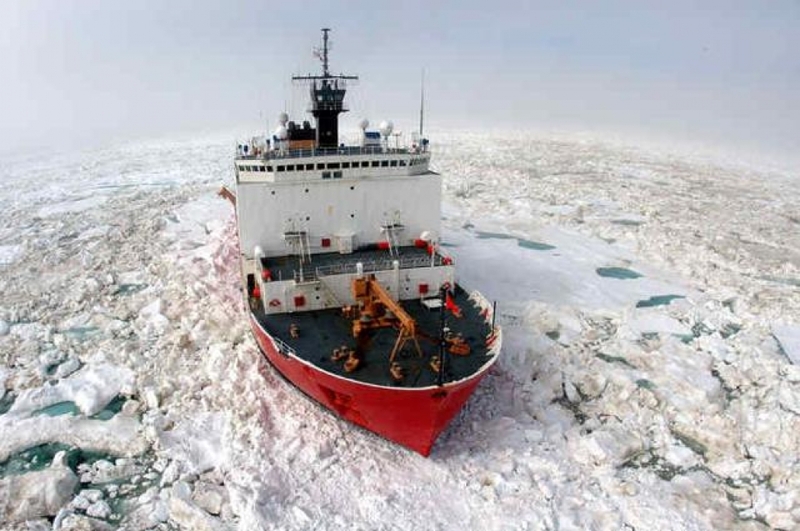 Budget constraints and the lack of currently available observing platforms, including icebreakers that can transport researchers and serve as floating science platforms during the winter and early spring, have hampered activities. The U.S. currently has just two functioning icebreakers, and Alaska’s senators, Republican Lisa Murkowski and Democrat Mark Begich, along with Washington State’s Democratic Senators Patty Murray and Maria Cantwell, have been trying to authorize funding for the construction of up to four new icebreakers for the U.S. Coast Guard. Rapid Arctic climate change has forced the U.S. military to re-assess its Arctic strategy, with the announcement of a new, more active strategy announced in November, and Murkowski and others said that new icebreakers would help achieve the military’s new goals, although the Pentagon has not requested them. While the icebreakers would be aimed at increasing the U.S. presence in the Arctic, including for national security purposes, scientists said new icebreakers would be welcomed by the research community. All-Time Heat Records Broken In . . . Alaska?